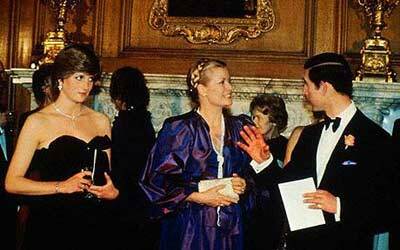 Prince of Wales and Lady Diana Spencer with Princess Grace of Monaco in 1981. The black dress worn by Diana, Princess of Wales, for her first official appearance with the Prince of Wales shortly before their engagement in 1981 surfaces at auction this summer. It was rumoured that the Princess had destroyed the black taffeta gown - but it turned up recently in a wardrobe at the studio of dress makers David and Elizabeth Emanuel. Now the iconic dress is set to fetch up to £50,000 when it appears at Kerry Taylor Auctions in London on June 8. The dress caused a sensation when Lady Diana Spencer, as she then was, bent down to climb out of the car. She was met with a frenzy of flash bulbs and next day& #39;s newspapers included the headline: "Daring Di sets fashion as she takes the plunge". But while 19 year old Lady Diana thought that black was elegant and grown-up, it was deemed an unusual choice as the Royal family wear the color almost exclusively for mourning. The public, however, went wild over the dress. In the run-up to her wedding, the nervous fiancée lost so much weight that she returned the gown to the Emanuels to have it taken in. The alterations required were so drastic that they decided it would be easier to re-make a smaller version for her. They kept the original and forgot about it, only re-discovering it quite recently. This gown forms part of the Emanuel Archive of Princess Diana-related material comprising 30 lots ranging from actual clothes worn by the Princess to fashion sketches, invoices, letters and related ephemera and expected to fetch a total of up to £175, 000. It charts the transformation of the Princess from a young, inexperienced teenager into a world-renowned style icon. A large part of the Emanuel Archive focuses on the Royal wedding gown and includes original designs and toiles for the bridal gown and bridesmaid dresses, the layered tulle petticoat worn by the Princess for fittings and rehearsals at St Pauls Cathedral, a duplicate sequined veil, invoices, letters from the Princess& #39; mother, correspondence with Buckingham Palace and a photographic record of the making of the bridal gown. The collection also features fashion designs for the Princess& #39; official tours to Venice 1984 and the Middle East in 1986.